A Visual Basic 2010 function is a type of procedure that returns a value which is passed on to the main procedure to finish the execution. A function is similar to a sub procedure but there is one major difference, a function returns a value whilst a sub procedure does not. 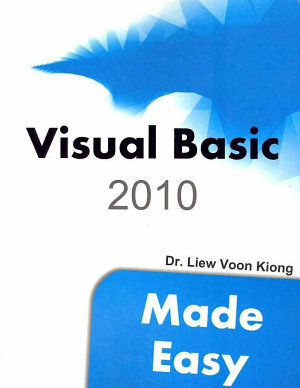 In Visual Basic 2010, there are two types of functions, the built-in functions and the functions created by the programmers. Functions created by the programmer are also known as user-defined functions. In this lesson, we shall learn how to create the user-defined function. The keyword Public indicates that the function is applicable to the whole project and the keyword Private indicates that the function is only applicable to a certain module or procedure. The argument is a parameter that can pass a value back to the function.There is no limit to the number of arguments you can put in. 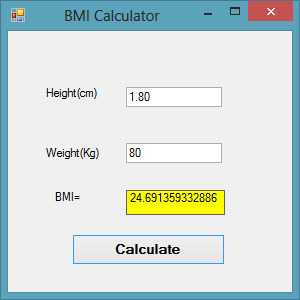 This BMI calculator is a Visual Basic 2010 program that can calculate the body mass index of a person based on his or her body weight in kilogram and the body height in meter. BMI can be calculated using the formula weight/( height )2, where weight is measured in kg and height in meter. If the BMI is more than 30, a person is considered obese. You can refer to the following range of BMI values for your weight status. The concept of future value is related to time value of money. If you deposit your money in a bank as a savings account or a fixed deposit account for a certain period of time, you will earn a certain amount of money based on the compound interest computed periodically, and this amount is added to the principal if you continue to keep the money in the bank. Interest for the following period is computed based on the initial principal plus the interest, this amount becomes the new principal. Subsequent interests are computed in the same manner. 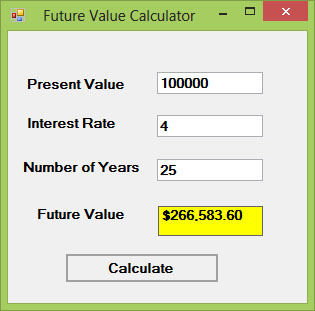 Where PV represents the present value, FV represents the future value, i is the interest rate and n is the number of periods (Normally months or years). Functions can be called by value or called by reference. By default, the arguments in the function are passed by reference. If arguments are passed by reference, original data will be modified and no longer preserved. On the one hand, if arguments are passed by value, original data will be preserved. The keyword to pass arguments by reference is ByRef and the keyword to pass arguments by value is ByVal. The function FV receives pv by value, i by reference and n by reference. Notice that although ByRef is not used to pass n, by default it is passed by reference. In this example, we created two functions that compute the square root of a number, the first uses the keyword ByRef and the second uses the keyword ByVal. 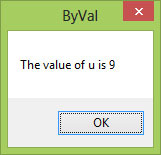 Notice that the value of u remains unchanged.